The Viper Barrel Vise is constructed of 6061 aluminum and the entire vise is powder coated with Dupont Powder coating and will not mar your barrel. Each hardened threaded bolt has a fully captured spring, that enables you to slide your barrel, in place, without having the top half falling down. 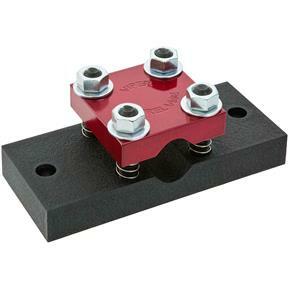 The vise has two 1/2" holes for mounting to a bench. I love this vise . It works on all kinds of barrels! This is a superb product. Very well made and does what a barrel vise is suppose to do. I highly recommend this to anyone looking for an affordable and reliable vise.